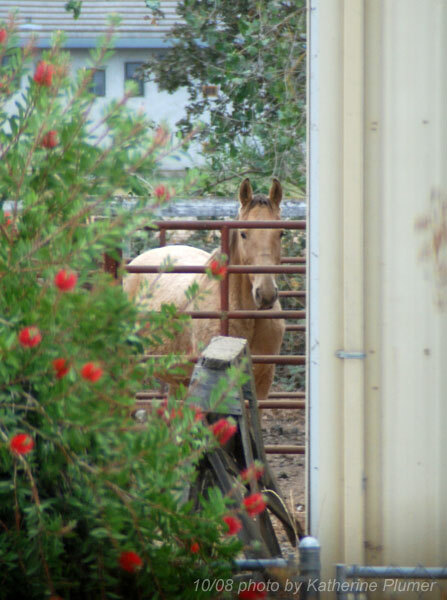 I'd guarantee the horse opened the gate, and now that he's been successful, he'll keep trying. I'm sending a copy of your blog for today to Bea, the lady who raised Dusty's sire. She's quite familiar with the trouble those Champagne colts can get into. Dusty has personally grabbed a T-shirt, thrown it across a barbed wire fence and shredded it; stuck his feet into a trash can used for water and (repeatedly) pulled it over and spilled the water all over; and tried to redo the wiring on my horse trailer (caught in the act). Those little ears are always alert and the eyes are always watching. I'm sure he knows what goes on in your house. I put a bungee cord around the gate latch now!